On July 4, 2018, the Asian Development Bank approved a $90 million loan to help Cambodia strengthen its rural climate resilience and renovate its agriculture sector. The Climate-Friendly Agribusiness Value Chains Sector Project will also be funded by an additional $10 million loan and a $30 million grant from the Green Climate Fund (GCF)—both of which will be administered by ADB. It is the first project in Cambodia to receive the GCF funding. It is also the first project to be implemented following the adoption of Strategy for Promoting Safe and Environment-Friendly Agro-based Value Chains in the Greater Mekong Subregion (GMS) and Siem Reap Action Plan, 2018–2022. The project is expected to improve regional cooperation and trade in the GMS, while highlighting ADB’s value addition, particularly in incorporating advanced technologies in development projects in the Asia and Pacific region. The agriculture industry—which produces, processes, transports, and trades farm products—accounts for about 33.7% of Cambodia’s gross domestic product. Agribusiness value chains in the country, however, are still largely fragmented and underdeveloped because of inadequate infrastructure, a weak policy environment for agribusinesses, and insufficient climate mitigation and adaptation efforts, particularly in dealing with the sector’s vulnerability to floods and drought. The project will boost the climate resilience of critical agricultural infrastructure while helping improve the competitiveness of the value chains of rice, maize, cassava, and mango production in Cambodia. The activities include the rehabilitation of irrigation and water management infrastructure; the upgrading of agricultural cooperatives’ value chain infrastructure; the improvement of farm-to-market roads; upgrading of infrastructure for safety and quality testing; and the promotion of renewable energy—solar energy in particular—to reduce greenhouse gas emissions. Through the project, ADB and GCF will help expand the use of advanced technologies such as laser land levelling to improve the efficiency of water use and enhance the capacity of stakeholders to operate and manage irrigation schemes. Information and communication technology (ICT) tools will also help provide weather, market, and agronomic information to create a more effective environment for climate risk management and reduce the agriculture sector’s carbon footprint. By improving climate resilience and sustainability of critical “last mile connectivity” infrastructure (e.g., tertiary canals, farm road networks) along the GMS transport corridors, the project aims to enhance regional connectivity and trade. Particularly, it will enhance the competitiveness of the agribusiness value chains in Kampong Cham and Tboung Khmum provinces along the GMS southern economic corridor, and in Kampot and Takeo provinces along the south coastal economic corridor. The total cost of the project is $141.04 million, with the Government of Cambodia and beneficiaries contributing $11.04 million. It is expected to be completed in the third quarter of 2024. ADB, based in Manila, Philippines, is dedicated to reducing poverty in Asia and the Pacific through inclusive economic growth, environmentally sustainable growth, and regional integration. Established in 1966, it is owned by 67 members—48 from the region. In 2017, ADB operations totaled $32.2 billion, including $11.9 billion in co-financing. 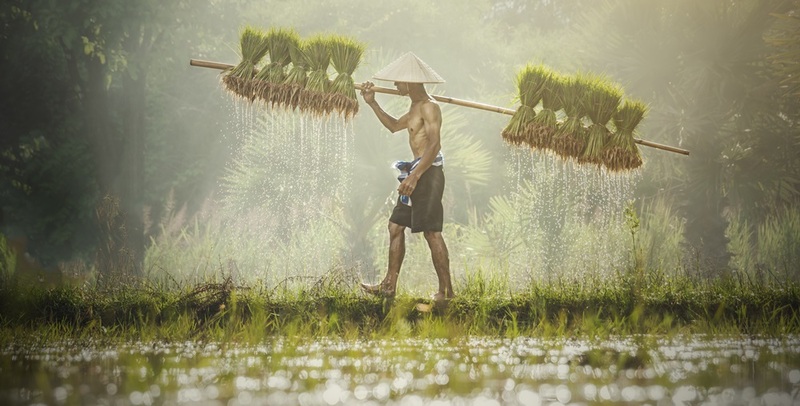 Photo of rice farmer carrying seedlings via Adobe Stock. See Asian Development Bank website.